เป็นหัวฉีดแบบพิเศษช่วยให้ใช้งานได้ง่ายจากทุกมุมหรือตำแหน่งต่างๆที่ไม่สามารถเข้าถึงได้ สามารถใช้งานได้อย่างง่าย ขนาด 400 ml. Stop squeaks: Penetrates and lubricates motion surface, hinges, springs, castors, windows, handles, pedals, conveyor and office chairs… Frees sticky mechanisms: Lubricates and un–jams door locks, zippers, tools, equiqments…. Stop squeaks by friction. 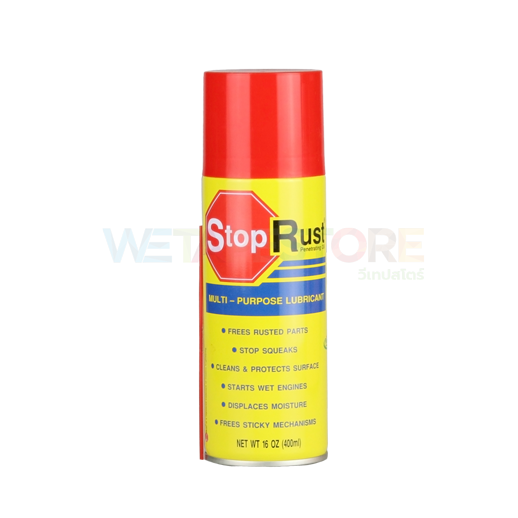 Drives out moisture: Drives out water on metal surfaces, like electrical contacts, car ignitions, start wet engines of car, motorcycle or ship, outboard motors and tools. Cleans: Dissolves grease, tar, gum, adhesive and other impurities… in most of surface such as: metal, porcelain, wood, plastic, glass, nylon, textile fabric. Protects: Leaves protective film against rust, eroded or oxidization… of metal, tools or equipments High apply in maintain machines, engines, equipments of mechanics industrial, electrical & electronics, auto, motorcycle. Loosens rusted parts: Penetrates and easy to loosen rusted, corroded and seized nuts, bolts, control cables and fasteners.